When you read that title, don't you just know that this recipe is going to be outstanding? Well, you'd be right. This one can be found in the August and September issue of Every Day with Rachael Ray, but I could not find it in their online archive (bummer, huh?). 1. In a medium bowl, whisk the egg white with the cornstarch, sugar, salt and pepper until a paste forms. [A paste will eventually form. Patience is a virtue.] Add the shrimp and toss to coat. Set the shrimp aside to marinate for 10 minutes. In a small bowl, combine the garlic, ginger and red pepper flakes; set aside. 2. Heat a large, heavy skillet over high heat for 3 minutes. [I used my regulation sized cast iron skillet for this. It worked perfectly.] Add the oil and swirl to coat the bottom of the skillet. Add the shrimp and the white and light green scallion pieces [this is where I figured out that I messed up with the scallions] and stir to coat with the oil. Cook, stirring and scraping up any brown bits from the bottom of the skillet, until the shrimp are almost cooked through, about 2 minutes. 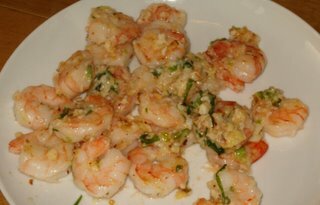 Add the garlic mixture and the dark green scallion pieces and cook, stirring, until the shrimp are cooked through, about 1 minute more. [Since I used cooked shrimp, I just did this until I thought they were warmed through.] Season to taste with salt and pepper. 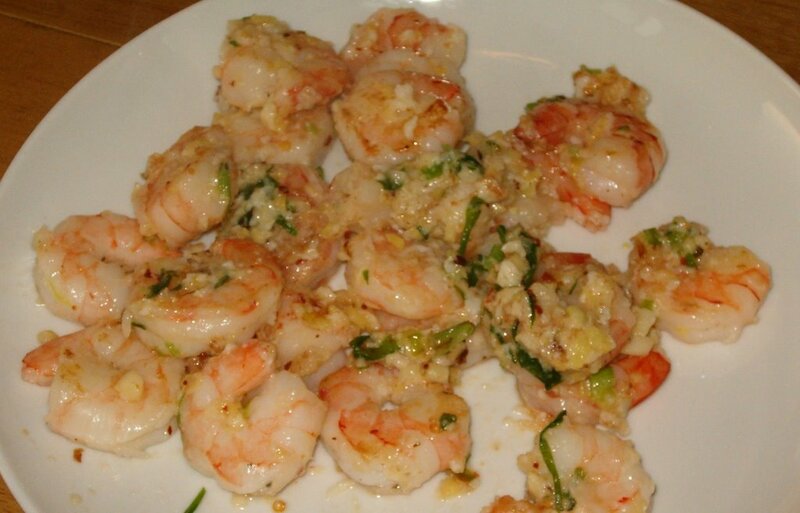 Transfer the shrimp to a large platter and serve with steamed rice. "I assume scraped means that you take the brown skin off the ginger. At least, that's what I did." That's right, and a great safe way to do it is to skip the knife for the scraping and use a spoon which you hold with your thumb in the bowl and scrape using the edge. The skin comes right off. Thanks, Mike. I usually do it the way Rachael recommends, which is to cut it off with a knife. Looks like her magazine is trying to break her bad habits (but didn't include enough detail for a cooking novice like me). Looks good. I normally just cut it off too. You and me both, Rachel. Thanks to Mike, we can keep all our fingers. Hi! Thanks for linking to my blog in your weekly roundup! This shrimp recipe is my all-time favorite. It's so simple and yet so incredibly tasty. You are welcome! This recipe is definitely one of my husband's favorites, too. I am not a huge shrimp fan, but I always get major points when I make them for him.